Great spare part set, better quality then the original screws! Das Schraubenset ist gut! Ersetzt perfekt ausgenudelte Schrauben. Für alle Nutzer des Race-Master Holsters absolut empfelenswert. Die Qualität der Schrauben ist deutlich besser als die der originalen Schrauben!!!! Warum können solche Schrauben nicht gleich dabei sein????? Glad to have a spare screw set around rather than have to hunt for them when I eventually lose one. In the screw pack I expecetd see an "External Activation Lever", since this screw is really exposed, not very thight and could fall off. I had a discussion with Saul on this subject. I also did not manage to dislodge the old safety lever. Acording to Saul I did not use the right procedure/equipmen. good set to have seeing I was silly enough to loose some of the screws from my holster. 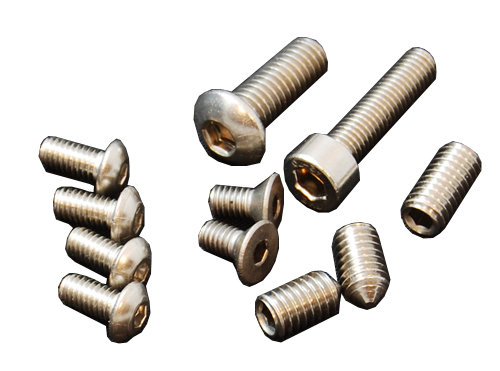 The screws are all top quality stainless-steel screws and so should not require replacement too often, but, it can be reassuring to have spare screws in your range bag. This is a complete set of all the screws used in the RM holster, packed in a bag and ready for use.